If you have five days to spend in Barcelona, we recommend that you loosely follow the 4-day plan that we have given you, leaving one of the plans below for the fifth day. 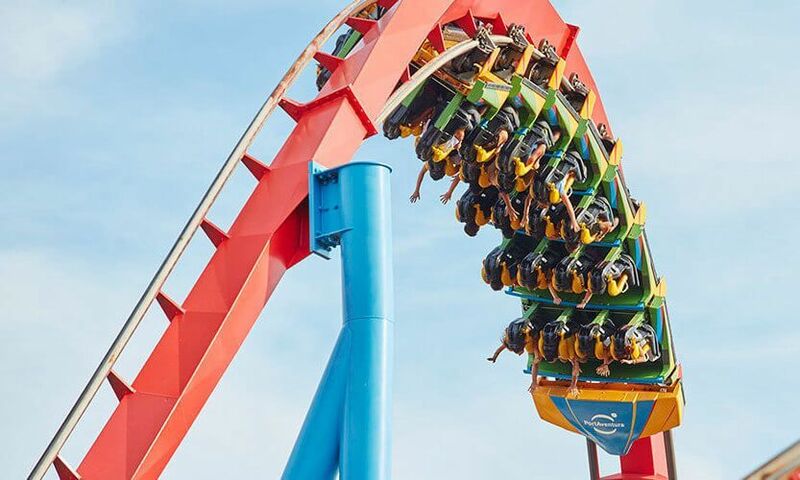 Whether you’re travelling with children, or you simply fancy a fun day out doing something a little different, going to PortAventura could be a great option for you. Between the end of May and the beginning of September, you also have the possibility to go to the Port Aventura’s aquatic park. Port Aventura is located in between Vila-seca and Salou, around 100km from Barcelona, so the journey will take you over an hour. There are many trains serving the line between Barcelona and Port Aventura. Where to catch the train: Line R16, from the Estación de Francia (Estació de França in Catalan), Passeig de Gràcia or Sants Estació. Arrival: at Port Aventura station. Combined ticket for train and entry: this combined ticket, which includes entry to the park and return rail journey, is the same price as entry to the park itself. You can buy tickets in any Renfe station in Catalunya, either on the day of your journey or up to 2 weeks in advance. To get to Port Aventura by car from Barcelona, you need to take the C-32, which links up with the AP-7, also known as the ‘Autopista del Mediterráneo’ (it’s the E-15 on the international E-road network). Once on the AP-7 you need to take Exit 35, which is dedicated to the theme park. Cost: you’ll need to factor in the price of the AP-7 toll road, as well as fuel costs. You can buy tickets for Port Aventura on the day itself in the ticket offices by the entrance, or you can buy online in advance, which will avoid any queues at the ticket offices. General admission: €45 (visitors aged 11-59). Junior admission: €39 (children aged 4-10). Senior citizens: €39 (visitors aged 60 and above). Disabled visitors: €23 (available to visitors with a minimum 33% disability). * The entry ticket to the Port Aventura Park does not cover entry to Aquatic Park. General admission: €28 (visitors aged 11-59). Junior admission: €28 (children aged 4-10). Senior citizens: €24 (visitors aged 60 and above). Disabled visitors: €15 (available to visitors with a minimum 33% disability). 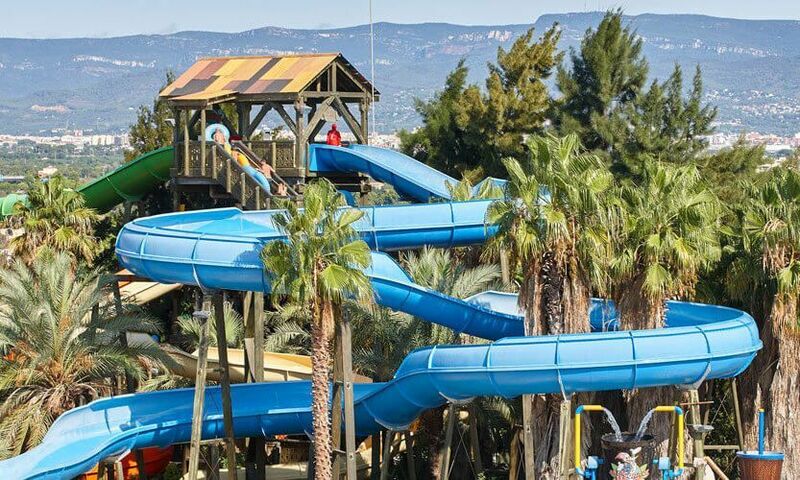 * The entry ticket to the Aquatic Park does not cover entry to Port Aventura Park. Closure: Port Aventura remains completely closed three months of the year, between 7th January and the beginning of April. Also, in November and the first weeks of December it only opens at weekends. Opening hours: the theme park opens at 10:00. The closing time varies according to the time of year (extending to midnight during the summer months), and the day of the week. Public transport timetables: as well as checking the opening times of Port Aventura itself, if you’re travelling by public transport you should also check the relevant timetables in advance, especially the last train or bus for returning to Barcelona. Food and drink: it’s completely forbidden to take your own food and drinks into the theme park. There are plenty of places to eat, especially fast food options, inside. Weather: whilst it’s not essential to go to on a sunny day, it’s best to go when there’s no risk of rain, since as you will be outside all day you might not otherwise get the full experience from the attractions. Day of the week: it’s advisable to avoid weekends and public holidays wherever possible, as this is when the city is at its busiest, so queues are bound to form to get into the park and to go on the rides. If you’re going to Barcelona during the months when the theme park is closed, or if it’s not your cup of tea, you could make the most of your fifth day in Barcelona by continuing to discover the city, visiting a museum or one of the sights that you haven’t yet seen, getting to know other areas of the city, or even having a relaxing day of shopping. Below we’ve given you three contrasting proposals, so that you can enjoy your last day in Barcelona doing whatever you prefer. The day starts by catching the Tramvia Blau, a traditional old tram that will take you up to the foot of Tibidabo Mountain. To get to the Tramvia Blau you should take the FGC (Ferrocarrils de la Generalitat de Catalunya) to the Avinguda Tibidabo stop. Buses 17, 22 and 73 also take you to the same point. The Tramvia Blau starts running at 10:00 in the morning; you should check its timetable before travelling, because during some months of the year it only runs at weekends. If it’s not running when you want to go to Tibidabo, you can walk up the hill (around 35 minutes); it’s a pretty route which will give you the chance to see the large mansions on both sides of the street, which in their time were second homes, away from the hustle and bustle of the city, for the wealthy folk of Barcelona. Now they serve various purposes – from embassies to old people’s homes and clinics. You have to pay for the short trip on the Tramvia Blau, and as it’s considered an attraction in itself, rather than public transport, it’s not served by the transport passes that we have told you about in the other areas of this site. The trip takes around 5 minutes, and it takes you up the steep hill of Avinguda del Tibidabo, arriving at the Plaza del Dr. Andreu. In this square there are 2 bars, from which you’ll enjoy some of the best views of the city – the Mirabé and the Mirablau. It’s likely that when you arrive they will both be closed, so the best thing to do is to pop in on your way back down. Then you need to catch the Tibidabo Funicular, which isn’t covered by the public transport passes either, and this will take you all the way to the top of the Tibidabo Mountain. Once you are up there, you can go into the Temple Expiatori del Sagrat Cor, a huge church that crowns Tibidabo. The views of Barcelona from the top of the church, as well as from many places around the summit of the mountain, are truly spectacular. 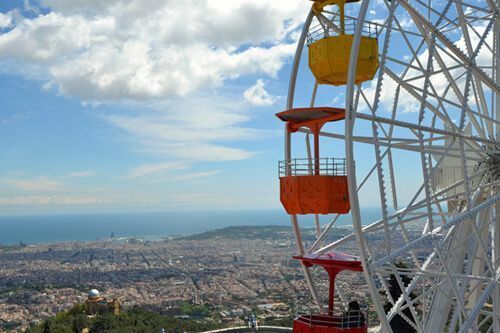 After visiting the church you can go into Tibidabo’s theme park (Parc d’Atraccions del Tibidabo) if you wish, which is ideal if you’re travelling with children. 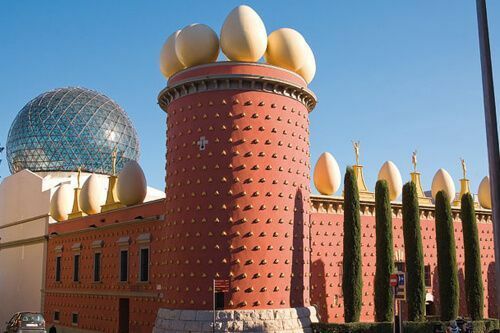 If you aren’t interested in going to the theme park, you can go for a wander around the area, and either catch the 196 bus or the funicular back down to the Plaça del Dr Andreu. If you do end up going to the theme park, it’s likely that you’ll want to spend most of the rest of the day there – although it’s not as big as Port Aventura, there are plenty of rides, and time will fly! If you have decided not to go to the theme park, you should arrive back at Plaça del Dr Andreu just at the right time for lunch. The Mirablau restaurant is a great option, thanks to its wonderful views of the city, and although there are other nearby bars (Merbeyé or Mirabé), these usually open a little later. After lunch you can return to the city centre, in time to have a final wander round the streets, to buy any last-minute gifts and to have a drink outside one of the many hotels. 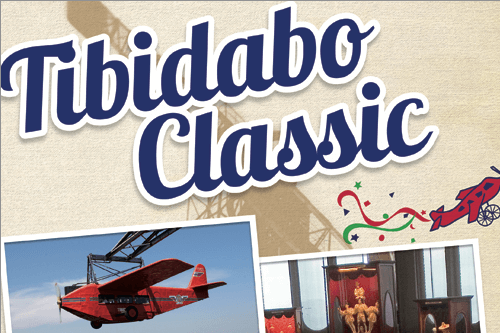 The ‘Tibidabo Classic’ card offers some discounts for people visiting Tibidabo, and also allows access to three of its attractions. Return journey to Tibidabo (the Tramvia Blau or 196 bus, plus the Tibidabo funicular). Entrance to Tibidabo’s ‘Camí del Cel’ – a walk with various viewpoints along the way. Entrance to the Museo de Autómatas (one of the most important museums of mechanical figures in the world), Miramiralls (a mirror hall) and a third attraction within Tibidabo (located on the Camí del Cel). Price: €11. You can buy it online on Barcelona’s official tourist website). If you are real fans of Gaudí’s work and you’re partly in Barcelona to see more of the modernist architect’s work, we recommend that you visit the Colonia Güell. 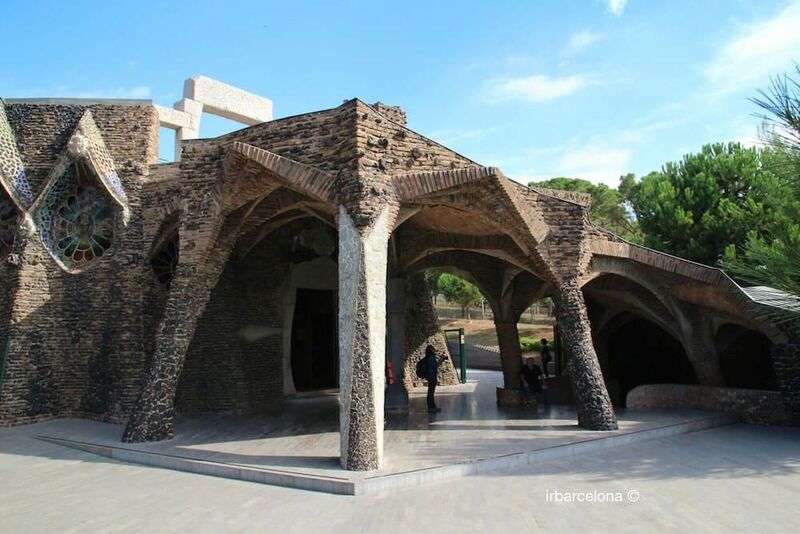 Located in the nearby area of Santa Coloma de Cervelló, the Colonia Güell project was commissioned by Eusebi Güell, to his great friend Antoni Gaudí, who designed the whole complex. Gaudí was also charged with the construction of the crypt, known as Cripta Gaudí. The rest of the buildings around the colony were designed by other architects, all of whom were regular collaborators with Gaudí. The Ferrocarrils de la Generalitat de Catalunya is the best option for getting there on public transport. You should catch the train at España station (Lines S33, S8 or S4), and get off at Colònia Güell station. The journey will take around 25 minutes. Although it’s neither as convenient nor as fast, if you wish you can get to Colònia Güell by bus. You will need to catch the bus in the Plaza Francesc Macià. The journey will take about an hour. If you decide to go by car, you should follow signs for Santa Coloma de Cervelló, via the C-31 and the B-2002 (towards Sant Boi de Llobregat), the C-32 (exit 53) and the A2 and the A7 (towards Sant Boi de Llobregat). The journey will take around half an hour, and once you arrive at the Colònia you can park in any of the free car parks in the area. Many companies organize visits and guided tours of the city, which is an excellent way to get to know some of the city’s history, and to see some of the streets, squares and sights that you might have already seen, but from a different perspective. There are various companies that specialize in these types of tours, many of them themed, and they can be anything from walking tours to bicycle tours or even on mopeds. 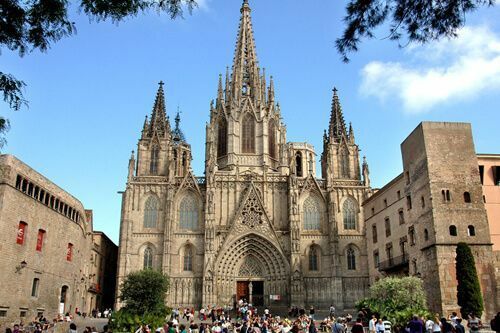 Themed guided tours of Barcelona, on foot. Languages: English and Spanish / Catalan. Length: depends on the route. 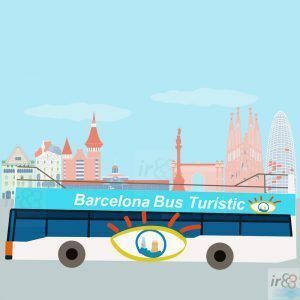 Languages: English, Spanish, Catalan and French (note that not all the routes are available in all languages, so it’s best to ask in advance for private tours in the language that you want). 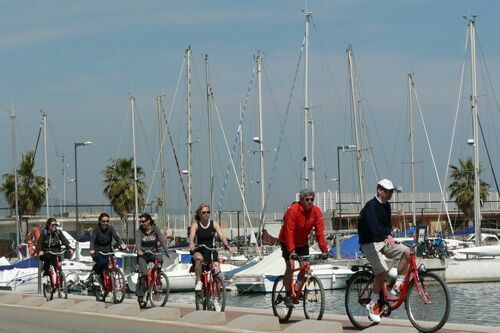 They offer various guided bicycle tours of the city. Languages: Spanish, Catalan, English, French, German, Italian and Dutch. Price: €22 – €28 (depending on the route). 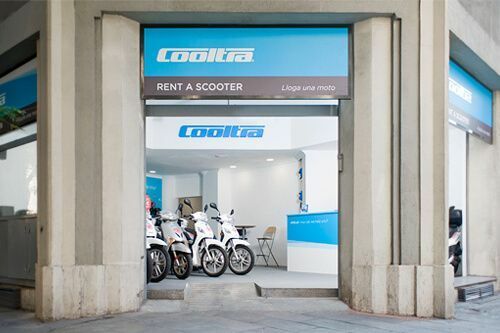 Guided tours of the streets of Barcelona, on Vespas. Languages: English, Spanish, Catalan, Italian, French, German, Dutch and Russian. Price: €100 per Vespa (minimum 2 Vespas, but 2 people can go on the same Vespa). Length: around 6 hours, in which you’ll cover around 60km. You also have the possibility to take part in guided tours or organized trips, run by the locals, like you’ll find in Trip4Real, or by speaking to one of the Barcelona’s official guides. We can guarantee that they will make your trip to Barcelona unforgettable. You could do the guided tour in the morning, which will give you a free afternoon for having a leisurely wander round the city, doing a bit of last-minute shopping, and taking time to have a drink in one of the many stylish hotels, from which you can enjoy impressive views whilst relaxing. 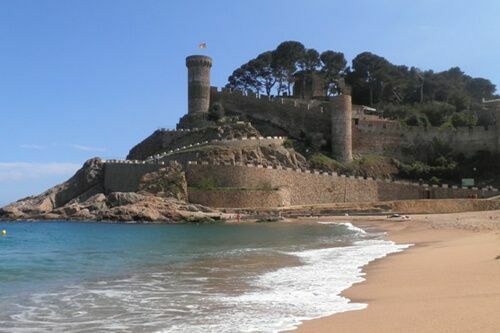 If you’re travelling to Barcelona during the summer months, a good way to get to know Catalunya whilst enjoying the sunshine and the beach is to take a day-trip to one of the region’s beautiful coastal towns. 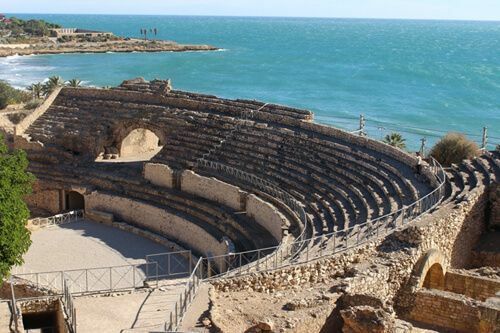 For this we recommend Sitges, around 40km to the south of Barcelona, or one of the many coastal towns on the Costa Brava, like Cadaqués, Calella de Palafrugell or Tossa de Mar. 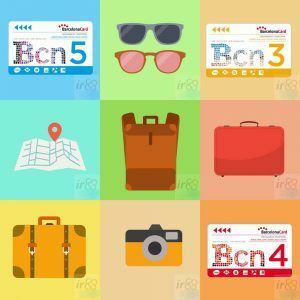 For your 5-day stay in Barcelona, we recommend that you purchase a Barcelona Card or a Hola Barcelona travel card (Hola BCN! ), which will give you some great savings on transport around the city. 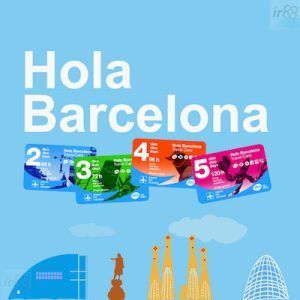 Price of 5-day Hola Barcelona travel card: €35.40. Price of 5-day Barcelona Card: €61.